"In Absentia (Deep Blue-White)," installation view in In Absentia at Night Gallery, 2017. Night Gallery is excited to announce the Dallas Museum of Art’s acquisition of Wanda Koop’s painting “In Absentia (Deep Blue-White),” 2017. The work appeared in Koop's solo exhibition In Absentia, which was presented at Night Gallery in the fall of 2017. The exhibition featured a series of works by the same title, exploring the connection between urbanism and the natural landscape. The paintings reference Koop's memories of the New York cityscape following a four-month residency in the city. 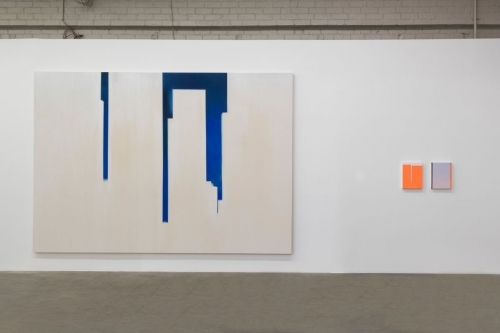 Koop’s sweeping view became the inspiration for a series of paintings that depict the skyline in stark, spare shapes filled in with rich gradients. "In Absentia (Deep Blue-White)" is one of three monumental works from the series; at 9.3 x 13.3 feet, the painting takes on the monolithic presence of its referents, the delicately-hued canvas filling the viewer's eye in a plane as expansive as the sky. Through minimal but highly evocative forms, the viewer is able to discern skyscraper from sky, foreground from background, solidity from void. What appears at first glance as pure abstraction is in fact a careful composition of colors in an indexical relationship. We are left with an impression of the natural and the manmade in harmony, co-constituted, suggesting the sublime. "In Absentia (Deep Blue-White)" will be on view at the Dallas Art Museum beginning in April 2019. A solo exhibition of Koop's work will be presented at the museum in fall 2019. Wanda Koop (b. 1951, Vancouver) lives and works Winnipeg, Manitoba, where she has been based since early childhood. Her painting career spans four decades and includes a major survey of her work mounted by the National Gallery of Canada in 2011. Koop has exhibited across Canada and the US, as well as in Europe, Asia, and South America. Her work belongs in the collections of the National Gallery of Canada, Ottawa, Canada; the Musée de Beaux Arts, Montréal; the Reykjavik Art Museum, Iceland; the Shanghai Museum of Modern Art, China; and the Glenbow Museum, Calgary, Canada, among others. Koop has been the recipient of numerous awards, honorary doctorates, and Canadian medals of honor, including the nation’s highest civilian honor, the Order of Canada, in 2006. Her life and work have been the subject of several documentary films.